The scourer (also called magnetic detacher) is used to clean out small particles – such as husk, dust and sand – attached to the wheat grain surface. It delivers the product ready and apt to be milled. The wheat enters tangentially to guarantee a good performance. The spinning action of the rotor’s beaters treats the product by centrifugation against the liner. The separation between the rotor and the liner is adjustable, to offer the better advantage of reaching the highest performance. 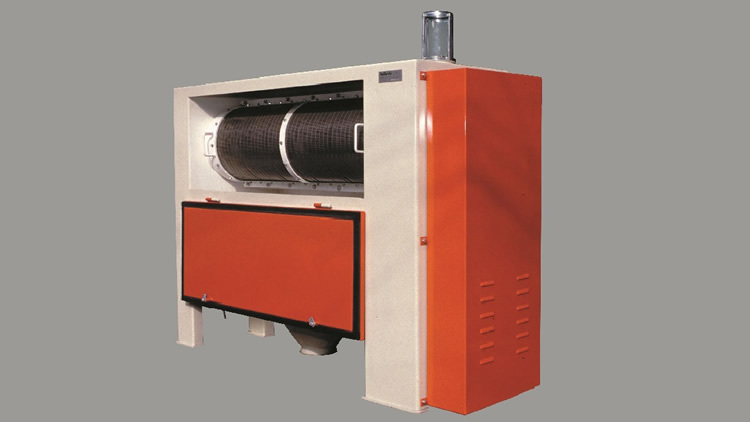 With doors at each side of the machine, it has the advantage of a liner that almost covers the entire circumference, while others in the market have much smaller liners. The group compound of pneumatic channel and air recycling aspirator is the ideal complement to this machine because it allows the right disposal of the waste products that were unable to go through the sieve. The pneumatic channel circulates air through a thin layer of wheat, taking with it the light particles but not the dust. These small particles fall in the air recycling aspirator and go out of the machine by a system of oscillating valves. The aspiration is adjustable through another valve.